Canon 6D have and Nikon both features newly developed CMOS sensor, Nikon have more advance AF system, see the comparison review below and select best entry level FF camera. 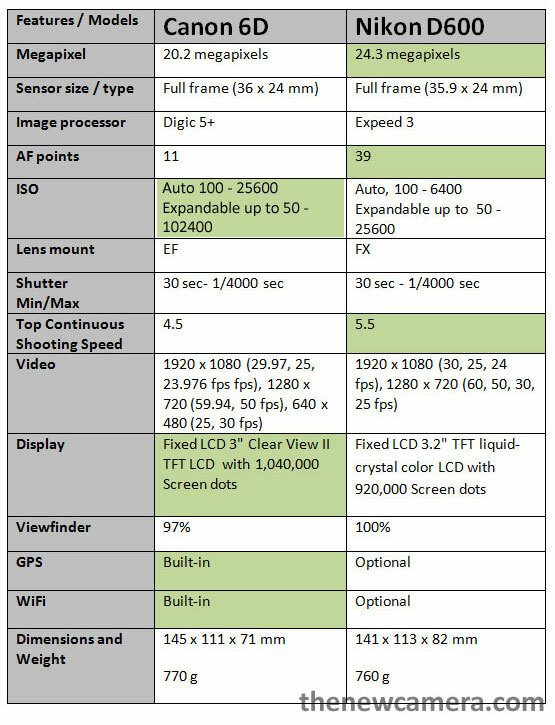 Sensor: Canon 6D and Nikon D600 both features newly developed sensor and ISO range of both the DSLR are same. Image processor: Both DSLRs are using best image processor available yet, Nikon is using Expeed 3 image processor of Nikon D4 and D800 DSLR on the other hand Canon 6D is using Digic 5+ image processor of Canon 5D Mark III and Canon 1D X. On Top Continuous shooting speed Nikon D600 have the upper hand, Canon 6D limited to 4.5 fps only. AF System: Both DSLRs uses phase detection AF system, Nikon D600 have more AF points compared to Canon 6D, But Canon 6D have more AF working range compared to Nikon D600. Display Unit(s): Canon 6D offers a high resolution display and a optical viewfinder with 97% coverage, Nikon D600 have bit bigger but lower res. display with a optical viewfinder with 100% coverage. Other features include is WiFi and GPS comes with Canon 6D, Canon 6D also features In Camera HDR and Multiple exposures are also possible in-camera and up to 9 exposures can be recorded onto a single file using 2 distinct settings for control, Nikon D600 is missing all these features. Conclusion: Canon 6D offers more standard ISO range and Nikon D600 have more AF points, but the Choice is yours. Remember Both DSLRs have full frame sensor, Nikon D600 offers advance AF system on the other hand Canon 6D offers you more standard ISO range, AF working range, built in GPS, WiFi and better display.